First in a series. Read the second part here. 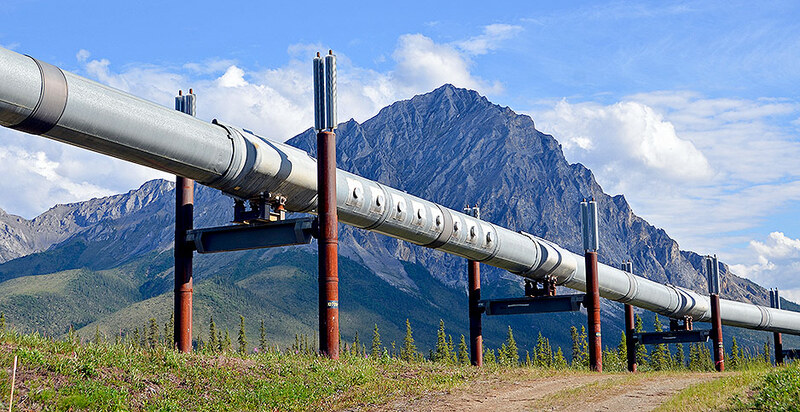 ANCHORAGE, Alaska — The story of the Trans-Alaska Pipeline System is the stuff of legends. The saga began shortly after Alaska became a state in 1959, when a young geologist convinced Alaska leaders to claim ownership of 1.6 million acres of frozen tundra along the Arctic Ocean. Nine years later, an exploration team drilled a well into the heart of those North Slope lands and discovered the largest oil field in North America. Oil companies with leases in the region were eager to commercialize their crude. But before the first shovel of dirt could be dug, the industry found itself enmeshed in the state of Alaska's bitter dispute over Native ancestral land claims. Congress ultimately stepped in to pass the largest land claims settlement in U.S. history. The 40-year saga of Alaska's jackpot pipeline.Click here to view the series. The industry also ran headlong into a powerful new environmental law, the National Environmental Policy Act. The proposed pipeline became the first major construction project required to assess the environmental impacts of their plans under NEPA, with environmental activists allowed to challenge those studies in court. After years of legal wrangling, Congress again cleared the way, but not before former Vice President Spiro Agnew (R) cast the tie-breaking vote in the Senate. The court challenges abruptly ended in 1973 when OPEC slapped an oil embargo on the U.S. for supporting Israel in the Arab-Israeli War. As U.S. oil supplies dwindled and Americans waited in long gas station lines to fuel their cars, Alaska's Prudhoe Bay oil was looked at as the answer to a worried nation's prayers. Congress passed a third bill, the Trans-Alaska Pipeline Authorization Act, eliminating any additional legal barriers to building the pipeline project. 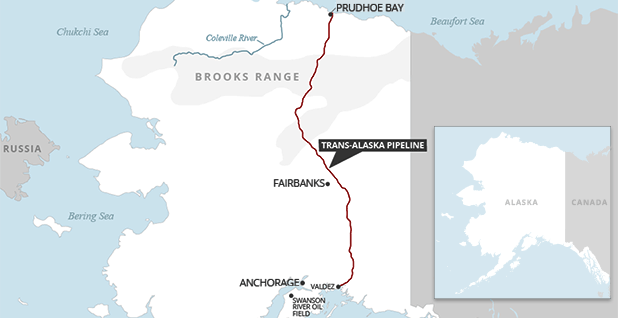 It took the industry-owned Alyeska pipeline company a mere three years and $8 billion to complete the 800-mile Trans-Alaska Pipeline System (TAPS) and a road to the North Slope. Forty years ago this summer, oil began flowing from Prudhoe Bay, down the pipeline, to a new marine export terminal at Valdez. Since then, TAPS has carried 17 billion barrels of oil and filled almost 22,000 oil tankers. To date, the state of Alaska has collected $141 billion in royalties and taxes from the petroleum extracted from the state lands. This summer, as the state celebrates the 40th anniversary of the Trans-Alaska pipeline, Alyeska is grappling with the cold, hard realities of declining North Slope oil production, an aging infrastructure and a growing wave of cyberattacks. During the last year, oil companies have announced a string of new oil discoveries that promise to boost pipeline throughput. However, energy companies and Alaska government officials insist that the best way to increase oil production is to open oil exploration in the Arctic National Wildlife Refuge and to expand the drilling in the National Petroleum Reserve-Alaska. President Trump argues that new oil development on Alaska's federal lands will help the U.S. achieve his ultimate goal of world "energy dominance," while raising billions of dollars from lease sales and creating thousands of jobs. But this time around, convincing Congress to sidestep national wildlife preservation mandates may be more difficult than it was in the 1970s. Today, paving the way for increasing Alaska's oil is no longer a national imperative, thanks to widespread shale oil development in the Lower 48 states. 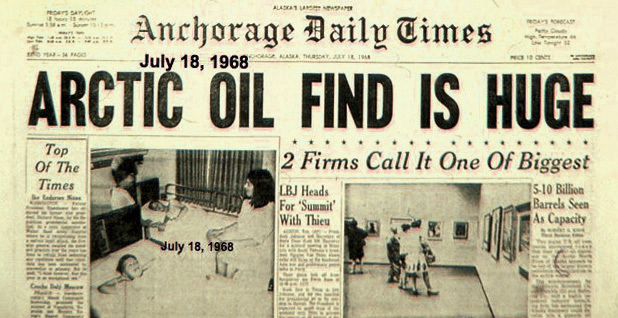 The original Prudhoe Bay oil discovery forever changed life in Alaska. Oil taxes provided a steady stream of funding for schools, roads, social services and luxuries like performing arts centers. "Oil caused growth, and this got Alaska over a threshold where other growth followed," explained Gunnar Knapp, former head of the University of Alaska's Institute of Social and Economic Research. "Suddenly, you get a Walmart, and you get chain stores. And then you get a hospital and a full-service law firm and full-service health care. Remember, before this, people used to buy cars outside of Alaska." Alaska Gov. Bill Walker (I), who was a high school senior in Valdez when Prudhoe Bay oil was discovered, observed that "Alaska is known for booms and busts — like the gold rush era." "But this time it was different," Walker said. "Because when it was all said and done, it wasn't just about extracting oil. It was about how it was going to change Alaska as a result." But like all classic tales, the pipeline's history includes a sobering tragedy. In 1989, the Exxon Valdez oil tanker struck a reef as it was leaving the Valdez marine terminal, spilling 10.8 million gallons of North Slope oil into the Prince William Sound. The accident, which devastated local fisheries and wildlife reserves, is considered one of the worst environmental disasters in U.S. history. Tom Marshall carried a tan-colored, hard plastic case into his cluttered living room and clicked open the latch. 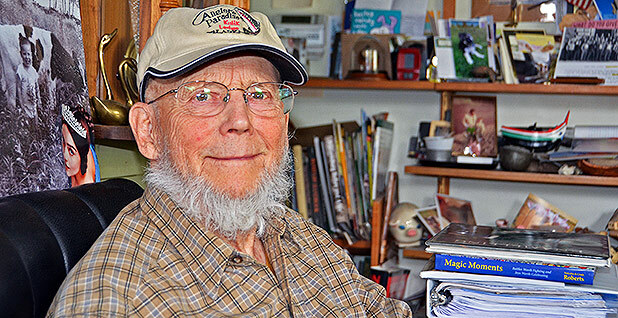 "I was looking at this just this morning," said Marshall, 91, a former state petroleum geologist famous for convincing the state to take ownership of the Prudhoe Bay region before oil was discovered. From the box, he carefully lifted a piece of equipment that looked like an elaborate set of goggles. "This gadget here is a little gizmo called an Abrams stereoscope," he announced with a big smile. "You put two aerial photographs together that are taken at something like 100 feet apart, and you look at them through this. "It's dusty now. But I made a good living with this." Marshall, a slight man with thinning grey hair and a bushy beard, packed the stereoscope in his suitcase when he moved to Alaska from Wyoming in 1958. This is the device he used to assess the oil potential of Alaska's North Slope lands. He remembers that Alaska's Arctic coast geology reminded him of the big oil basins he'd seen in Wyoming. "Wherever I could get aerial photos, I'd look at them," Marshall explained. "Because if I could find a geological structure, a fold in the sediment that was closed at both ends, you could almost be sure that the closure could trap oil, if oil had gotten in there." "I needed to find something [geologically promising] that would have the oil reserves large enough to justify building a pipeline," he said. "Because this oil would be worthless unless it could get to Valdez." After reviewing historical aerial photographs taken by the military and the U.S. Geological Survey, Marshall concluded that the North Slope tundra might very well hold a sweet spot. On his recommendation, the state of Alaska claimed ownership of a large part of the Arctic Coast under the statehood provisions granting Alaska 105 million acres of land. Not everyone agreed with Marshall. One longtime Alaska oil prospector ridiculed the state's land choice as "Marshall's Folly," a reference to U.S. Secretary of State William Seward's decision to buy Alaska from Russia in 1867. It wasn't until the oil companies struck black gold at Prudhoe Bay that Marshall found out just how right he was. Shortly before the discovery was officially announced, someone stuck his head into Marshall's office and yelled "Marshall's folly isn't a folly anymore." Thanks to Marshall's calculations, the oil companies would soon be pouring royalty and tax money into the state of Alaska's coffers. Before the wells were drilled, however, "no one knew if there was oil, or where," Marshall said. "Believe me, it was a big mystery until the discovery was made." Well before the discovery of Prudhoe Bay's elephant oil field, petroleum was part of the narrative of Alaska. The state's Native communities traditionally used oil-soaked sod for fuel. Early fur traders and gold prospectors made note of oil seeps they encountered on the North Slope and Alaska Peninsula. Small oil discoveries in northwestern Alaska convinced President Harding in 1923 to set aside 23.6 million acres of territorial lands as the Naval Petroleum Reserve No. 4, which later became the National Petroleum Reserve-Alaska. But despite scattered drilling in the state, the promise of Alaska oil didn't catch fire until 1957, when Richfield Oil Corp. found a sizable oil field at Swanson River on southern Alaska's Kenai Peninsula. Soon, oil companies began flocking to the state. That Swanson River discovery convinced Congress to grant statehood to the remote, rustic Alaskan territory. But building a state proved difficult in the Land of the Midnight Sun. "Basically, Alaska was on starvation rations in the early years of statehood because we had a small population, no industry of any consequence, just a little oil production from the Swanson River," noted Native activist Willie Hensley, who was a state legislator at the time. "The state couldn't afford to do anything for its citizens," he said. "We had no cash for capital construction. Every time we wanted to build something, we had to have a statewide bond issue." Petroleum companies drawn to Alaska by the Swanson River oil find soon sent geological teams to survey other parts of the state, particularly to lands north of the Arctic Circle. Former BP geologist Roger Herrera was part of the first field study team that BP sent to northern Alaska in 1960. Herrera recalls that BP decided to explore the region after a top company official took a flight to Anchorage that passed over the Brooks Range. He immediately saw similarities between Alaska's mountains and Iran's oil-rich Zagreb mountain region. "He [the company official] said to himself, 'If there are any foothills that are full of oil, it's these foothills,'" Herrera explained. "So he landed in Anchorage, went back to London and said, 'We've got to look at the North Slope of Alaska.'" Herrera's first assignment was analyzing the rock along the Brooks Range foothills. In late 1961, the company began drilling a series of wells that indicated the best oil potential might be found in the lands north of the foothills. Meanwhile, in 1963, Richfield Oil sent young field geologists Gil Mull and Gar Pessel into Alaska to map the large expanse of the state's north-central lands between the Colville River and the Canadian border. Mull recalls that they soon discovered oil-rich rock formations and seeps. Pessel dashed off a letter to his bosses explaining: "We have a good section with excellent reservoir possibility and positive proof of the petroliferous nation of these sands. If one cannot get an oil field out of these conditions, I give up!" Both companies followed up their geological studies with seismic surveys that hinted at a massive oil reservoir under the North Slope tundra. In 1965, when the state held a lease sale for those lands, BP and Richfield, which had joined forces with Humble Oil and Refining Co., were the highest bidders for much of the Prudhoe Bay region. After drilling several dry holes, BP succumbed to financial concerns and postponed further exploration. But ARCO, created when Richfield merged with Atlantic Refining Co., and Humble continued. In late 1966, the ARCO team drilled its "Susie" well, located on federal lands about 60 miles south of Alaska's Arctic coastline. When that hole came up dry, they agreed to move north to the state leases they'd acquired the year before. That untested site was known as Prudhoe Bay. Mull said the fate of the company's North Slope operation was at stake at that well. "I'm pretty sure that within ARCO, if we had not found anything, it would've been hard to get approval to drill another well," he explained. 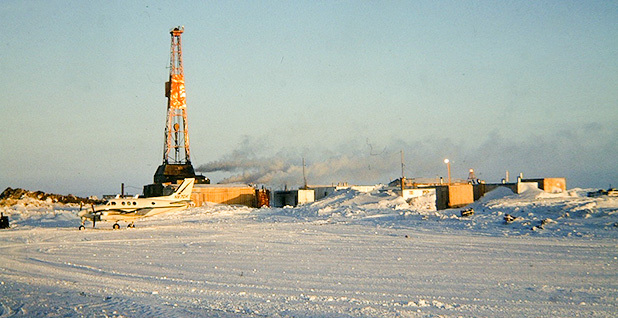 In the spring of 1967, the companies spudded the Prudhoe Bay well but decided to postpone operations until the thawing ground refroze that winter. When drilling resumed, the team quickly found evidence of natural gas in the drilling muds. Around Christmas, the team decided to conduct its first advanced test. "That was truly amazing," Mull recalled. "They opened the tool for the well stem test, and there was an absolute and immediate flow of gas that blew water out of the well. It was immediately followed by high-pressure gas. It was a rumble and a roar that was shaking the rig like a jet plane flying overhead. "The high-pressure gas was diverted into a flow pipe. It was ignited, and it burned for a number of hours," he said. "It was pretty exciting, to say the least." The gas plume burning like a massive torch on the North Slope was reported by commercial airline pilots flying over the Arctic. Alaska is known for booms and busts — like the gold rush era. ... But this time it was different. Because when it was all said and done, it wasn't just about extracting oil. It was about how it was going to change Alaska as a result. Alaska Gov. Bill Walker (I), who was a high school senior in Valdez when Prudhoe Bay oil was discovered. Several weeks later, the well reached oil, and the team reported a remarkable flow rate of 1,152 barrels per day. But it wasn't until the companies drilled a second well 7 miles away that the enormity of the find was fully understood. The second drill site, Sag River No. 1, produced even more remarkable results, Mull explained. "Usually you take core samples that come out like a cylinder of hard rock, about the diameter of a wine bottle, for example," he said. "Well, they took one core off and instead of a solid cylinder of rock coming out, it was just a mush of disaggregated sand and gravel and oil," Mull recalled. "Oil came pouring out of the core onto the rig floor and right through the rig floor into the cellar. So everybody knew what was happening. It was pretty evident you had oil." The independent oil consulting firm DeGolyer and MacNaughton concluded that the Prudhoe Bay oil field probably held 5 billion to 10 billion barrels of recoverable oil. Further studies showed that the ARCO-Humble oil leases were positioned primarily on a bubble of natural gas that sat on top of the massive oil reservoir. Whereas BP's leases were located over the richest section of the oil pool. Mull remembers that the ARCO-Humble field team was all smiles as the drilling progressed and the discovery became obvious. But he doesn't recall any champagne and steak celebrations at the drill site. "I think the biggest announcement we got was an internal letter that said, 'Yeah, looks like we've found something.' But they were worried about insider trading. They said, 'Don't even think about buying or trading in Richfield or Humble stock. Don't even think about it before these announcements are made,'" Mull said. "That was probably the most official document we had."